Beach Volleyball players use secret signals! The fun sport of playing beach volleyball is said to have first taken place on Waikiki Beach in Hawaii at the Outrigger Canoe Club in the year 1915. From this first documented game in Hawaii, beach volleyball has taken off massively on beaches around all the world. The game has many benefits as well. It’s a great form of exercise and playing beach volleyball for around one hour in fact can burn well over 600 calories. Also, the actions performed when playing the game strengthen the muscles in the arms, upper body, shoulders and abdominals as well as the lower legs. It promotes team spirit and can improve hand to eye coordination, balance and reflexes but more than any of this it’s simply a wonderful social activity. Don’t forget to go carefully however when playing beach volleyball for even though it’s played on sand there is as with any sport risk of injury so it’s always best to go steady! Beach volleyball is played by 2 teams of 2 players on a sandy surfaced court divided by net. It has been included in the Olympics since the 1996 games. Similar to indoor volleyball, the basic idea is to propel the ball over the net and ground it on the opposing court and in the process stop the opponents doing likewise. Any team is only allowed maximum three touches of the ball to get it back across the net. A player begins play with the serve in which the server hits the ball from behind the rear court boundary so that it passes over the net to the opponents. The rally continues until either the ball is grounded in an opposing court or goes out of play. When either team wins a rally then they score a point and serve again. The serve changes hands each time a rally is won by the team receiving. 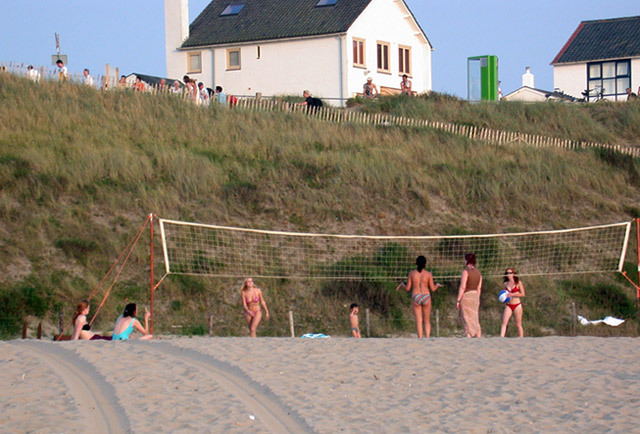 The vast expanse of beach that Zandvoort enjoys makes it ideal for many recreational activities. Of course sailing, windsurfing and kitesurfing are amongst the most popular but the average width of 100 metres along its 9 kilometre stretch makes it ideal for ball sports, especially volleyball. 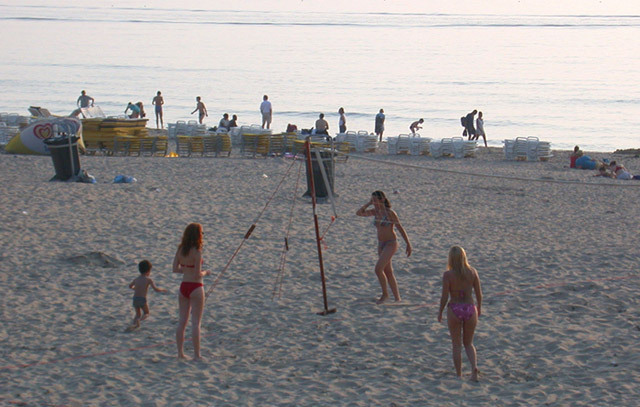 In the warmer weather, you will see many games of volleyball being played with both locals and tourists enjoying the sport. It’s a great way for many young people to make new friends and the choice of 41 beach cafes at which to take a welcome break with a refreshing drink is an added attraction.